Complementary to Unique SATCO®"HOSE THROUGH CENTRE" system. SATCO® Boom and Arm sets can be supplied to fit SATCO® Felling Heads or Processors with the unique SATCO® 'hose through centre' system and will optimise the working range and the lifting capacity of excavator type carriers. SATCO® OEM replacement Forestry Arms fit directly onto the standard boom and the length of the arm is set to maximise the working range of the attachment. Hosing to the attachment runs through the centre of the arm. By combining extensive OEM base machine information, Finite Element Analysis and the SATCO® design approach, the SATCO® Boom and Arm is proven to be strong, reliable and extremely competent in all aspects of the front line logging industry. Whether you are tree felling, shovel logging, processing on the deck or loading out, SATCO® Boom and Arm products can save you time and money. 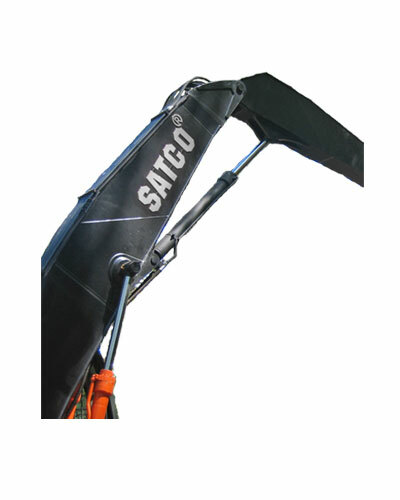 With higher lifting capabilities, extra reach, underslung dipper cylinder mounting for cylinder protection and unique 'hose through dipper' system SATCO® Boom and Arms can in most cases downscale the size of your base machine and can be set up for any type of attachment required. The unique SATCO® 'hose through centre' system protects your hydraulic hoses by enclosing them internally in the dipper and through to the 'hose through centre' attachment making hose damage rare and saving on hose doctor callout services. By using existing OEM boom lift and dipper cylinders, warranty and parts issues are avoided. The SATCO® Boom and Arm sets are a proven product: strong, reliable and extremely cost effective. SATCO® Boom & Arm Sets are constructed using high grade materials and manufactured using the best robotic welding wire for a far superior weld.